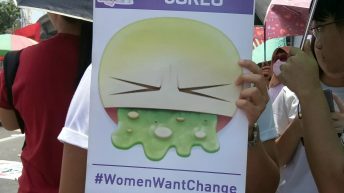 This is a special report in a series produced by Bulatlat.com with the Asia-Pacific Forum on Women, Law and Development (APWLD) Media Fellowship. The series aims to report on linkages between gender, ecological conflicts and climate change. 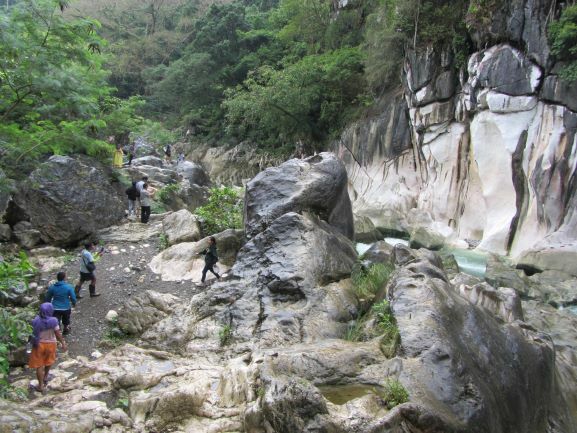 MANILA – Right now, tourists are likely enjoying a walk or sightseeing by the river of Daraitan in Tanay, Rizal, a mountainous province east of Manila. The clear water and the way huge slabs of rocks have been cleaved by the raging river, creating a challenging trek and a beautiful sight, and caves with pools of cool water inside, have attracted campers and backpackers to the villages around it especially in summer. Inside one of the many caves in Rizal and Quezon the indigenous peoples, the Dumagat and Remontados, pray to their God, the creator they call Makijapat. The Dumagat live by planting food crops in the mountains, fishing, and hunting. The mountain forest and the watershed are key to their survival and also of those downstream. The mountain range has historically served to break or weaken strong typhoons and absorb excess water runoff. 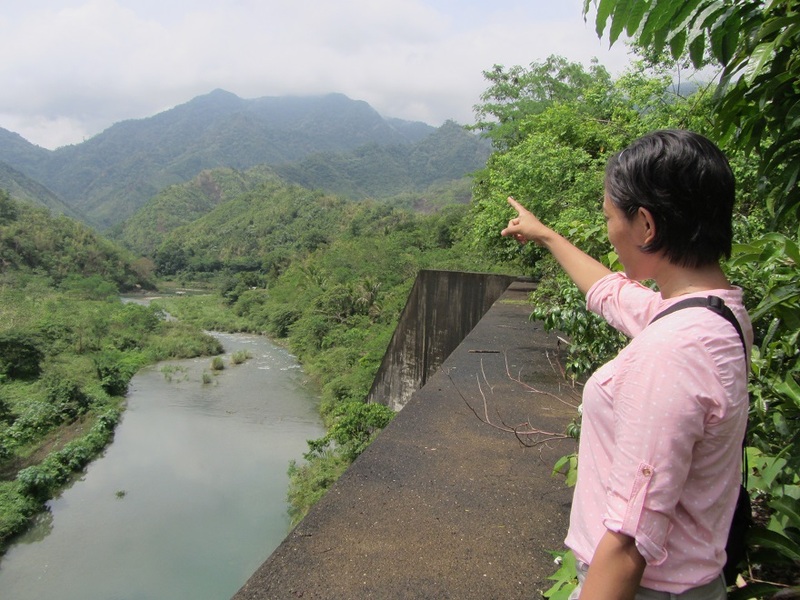 Given the grim forecast on climate change, its effects of generating some increasingly strong typhoons, or intense droughts, the Sierra Madre mountain range needs all the protection it can get to maintain or expand its forest and watershed. But the indigenous peoples’ villages and the others farther upstream are in danger of losing it and all that the river sustains to mega-dam projects. The Dumagat and Remontados stand to be the most immediately affected – they are the first to be displaced. In fact, some of them are already bearing the brunt of the dam projects even as construction has been repeatedly stopped. The next to be affected are the farmers and communities downstream who would have to live with reduced guards against the impacts of climate change. 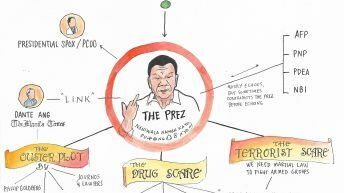 What the people in Quezon and Rizal have opposed and stopped successfully for four decades now since the Marcos dictatorship keeps resurfacing as a threat. The Duterte government’s “Build Build Build” projects constitutes the latest threat. It includes as one of the priorities the construction of large dams such as the Laiban dam, the Kaliwa (left) and Kanan (right) dams, or the Php12.2 billion New Centennial Water Source-Kaliwa Dam, which will be 85% funded by China. Last Nov. 20, the Chinese leader visited Manila and one of the agreements he oversaw was funding the New Centennial Water Source Project. 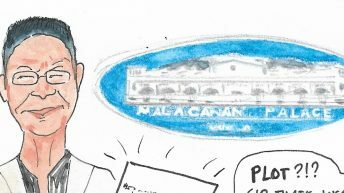 Under the New Centennial Water Source-Kaliwa Dam Project, the Duterte administration targets to build the dams over more of the same rivers in Rizal and Quezon despite protests and proven negative impacts of large dams. 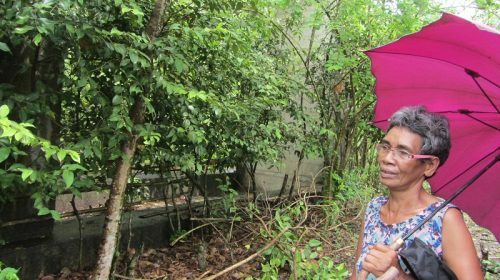 For Nanay Nene Baylon, the first Laiban dam project continues to exert a heavy toll on her family’s livelihood. The Laiban dam was eventually stopped by massive protests in the 80s, but by then its massive twin gates had been forcibly constructed in their village. It has since deprived her family and that of other Dumagat of their years-long farm land. They were planting vegetables and root crops on the piece of land that became the cleared hilltop of the dam’s humongous gates. Nanay Nene told us her family and neighboring farmers were neither compensated for the crops destroyed when the dam’s gates were constructed nor for the land that was taken away from them. A young wife and mother at the time under the Marcos dictatorship, she said the construction crew and machinery came without warning and despite their protests. She recalled how their villages were suddenly choking in dust stirred up by trucks and machinery which were escorted by government soldiers. The river turned muddy as workers and machine crossed it, then burrowed into and exploded parts of the mountain by the river. Now, Nanay Nene is older, but she remains emphatic for the struggle to stop the renewed drive to construct the series of dams. 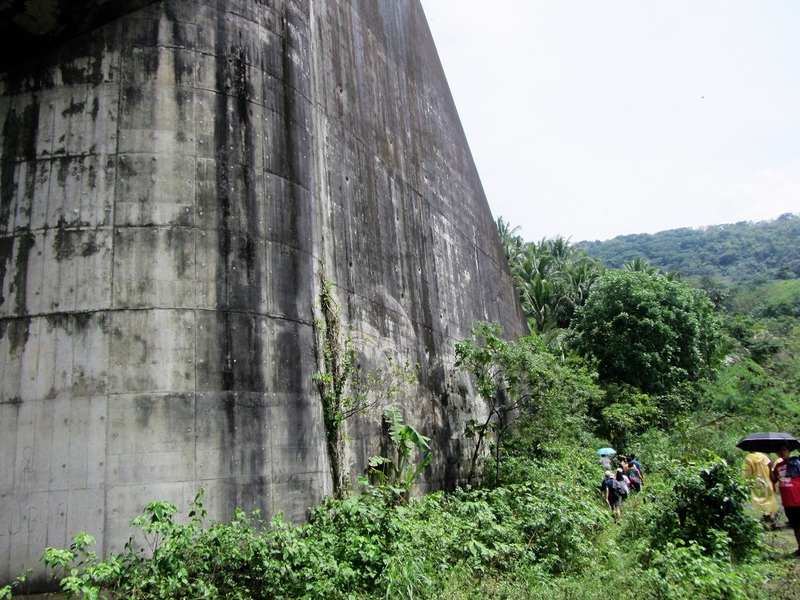 The Laiban dam’s gates continue to be guarded by armed security. Two years ago, as news broke out that the dam project was being pushed by the Duterte administration, the guards of the unused dam gates stirred up anew the villagers’ outrage. The guards fired at and killed two Dumagat farmers who just happened to take a shortcut going downstream — they passed by the dam’s gates. 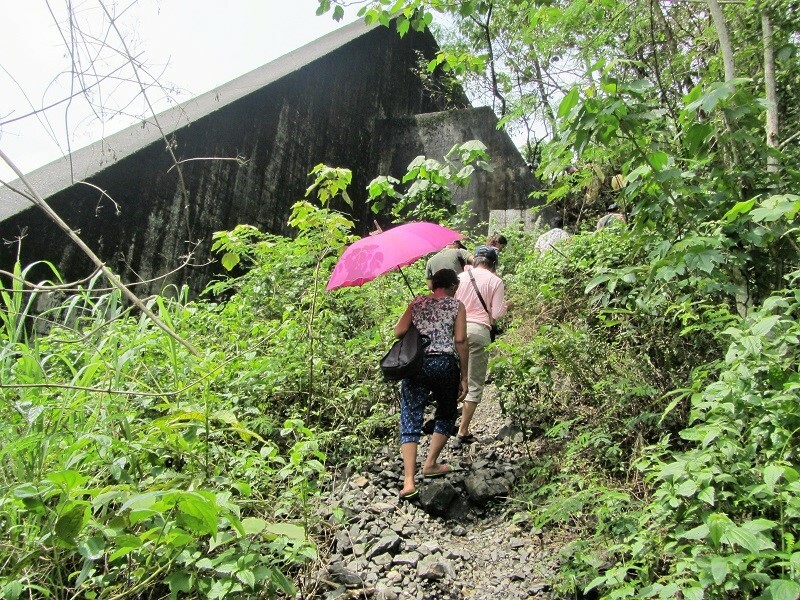 Climbing to what was once the Dumagat’s farm but is now overgrown by grasses, and yes, dominated by the thick concrete wall of the dam gate, Nanay Nene’s lips thinned as she recalled the days of the gates’ construction. After the construction was halted, the communities by the river regained a portion of past tranquility, she said. The water became clear again. They planted food again, without fear, in other parts of the mountain further upstream. But there is the ever-present threat that all this may end, as they keep hearing about the dam projects being repackaged or pushed again. With other women Nanay Nene has taken to joining initiatives to oppose the renewed drive to build mega dams where they live and farm. To their community, it is a struggle not just for their right to the land and to their self-determination, but also a struggle to save the river, the remaining forest of Sierra Madre and the watershed in it. It is a struggle demanding time, patience and courage, the other women admitted. They have to face not just their fellow Dumagat and the city people, but also the militarization and the fear that if they are not careful, they could end up divided and scattered like the jagged rocks pushed apart by the Tinipak River. 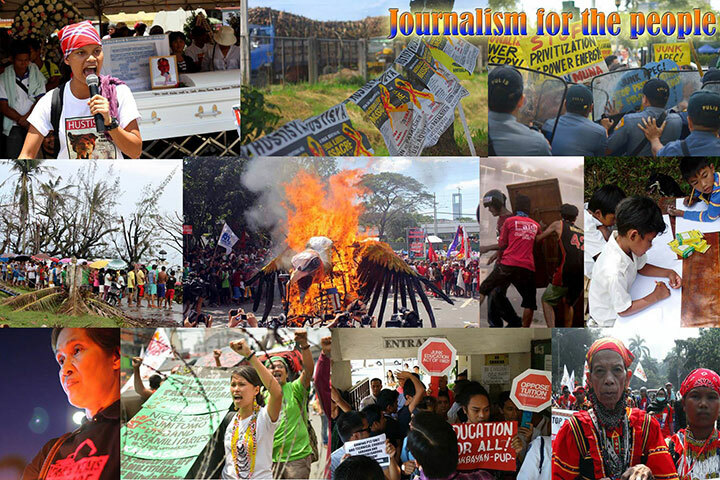 The Dumagat communities and the Filipinos in general have by now numerous tragic experiences with dams. People from north to south have been displaced by earlier dam construction without compensation or rehabilitation. Rivers have become more polluted, farms have lost irrigation when they needed it most, and were inundated with excess water when they needed it the least. People have died from the dams’ sudden or heavy release of water in times of typhoons. By now, scientists and environmentalists are saying, we should know better not to resort to building more dams. Add to this, the suspicions of progressives that the Philippines does not really need another dam. Neither were the dam projects needed for energy because according to non-government thinktank Ibon Philippines, using data from the Dept. of Energy itself, there are enough sources of energy and it could still be increased beyond the Philippines’ projected needs if the current dams were rehabilitated. With global warming and climate change, normal or extra-strong typhoons are becoming more disastrous than ever, offering more pressing reasons not to destroy the remaining forest and watershed to build unnecessary mega-dams, said the group AGHAM (Science for the People and Center for Environmental Concerns). Dams have not brought the people cheaper and reliable energy, nor irrigation, as promised when the first dams were built, said peasant woman leader Zenaida Soriano of Amihan on another occasion. She has seen in peasants’ lives across the country how dams have wrecked the rivers and the environment, harmed the people’s agricultural practices and killed hundreds of people in periodic flooding and flashfloods. To this day, dam opponents are being surprised by bitter sharing that many had died from flashfloods without being reported in the news. Danilo Peralta, 62, said some 317 died unreported as a result of sudden release of dam water in Umiray River in 2004. Today another dam, taking off from early 2000s when protests stalled it, is now being pushed to add to Sumag Dam in Umiray, the river in the boundary of Quezon and Aurora. Dams have privatized the control of river, water and energy, further making life more difficult to women struggling to feed their family. In various fora, representatives of the Dumagat and others who have experienced dislocation due to dam-building recounted how water used to be available, abundant, sparkling clear and for free. That changed after they were pushed away because of the dam. Either they have to pay for water or they have to trek longer to find other sources of water. The Duterte government’s revival of dam projects that have long been opposed by a broad coalition of people is nothing short of a declaration of war on the people, the Dumagat women leaders said at the launch of a coalition opposed to New Centennial Water Source Project. 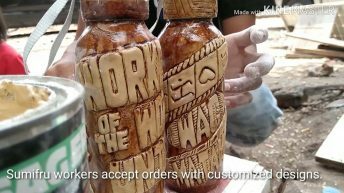 To people like Nanay Nene, this war comes complete with military deployment and government agencies coming to their communities to “consult” and get their approval. In some communities especially those likely to be enclosed in the planned dams in Quezon, young Dumagat women said the community members’ moves are being monitored and questioned by the military. Some villages are regularly visited by government soldiers, or they could see armed government troops circling the village. Whenever the villagers talk in groups, soldiers would come asking what the talk is all about. In Umiray village where one of the dam projects will be built, the Dumagat women’s group Imaset complained that their fellow Dumagat have been forced to live in a hamlet condition under military control and surveillance. “They cannot go to work the field and they frequently went hungry,” the women said of fellow Dumagat. Shortly before they formed the Imaset last August, they went on a rescue and relied mission with other support groups of the indigenous peoples. Amid the palpable intimidation generated by the presence of armed troops, some Dumagat are also more rapidly losing their land. A village health worker said part of the reason is also the Dumagat’s natural generosity. They don’t think twice about letting another person or family to plant on their land. They did not know that pretty soon, that person would claim the land, with a piece of paper, unlike in the Dumagat practice where eventually they leave the piece of land they planted with crops for some time to let it recover. Another reason is the expansion of land ownership of wealthy individuals, a village health worker and also a tour guide said. 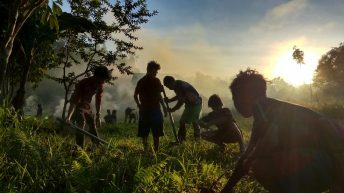 When we visited their village in mountainous Tanay, Rizal, he pointed to men clearing a wooded part of the mountain along the newly built road to the Dumagat communities. He said these are hired farm workers by “new owners” of that land in the mountain. In Sta. Ines, the last village of Tanay, Rizal going north that has parts being claimed by neighboring Gen. Nakar, Quezon, a Dumagat teacher told Bulatlat they only have certificates to their claim to the land, which is not yet a CADT (Certificate of Ancestral Domain Title). She noted that they seem to be losing the land to those with money who can afford to plant more crops over more land. The health worker said the communities definitely welcomed the new road built in late 2018. He said this will make it easier for them to go down and sell their produce – but he hoped the road comes with agricultural aid. He feared the cost of transport cuts into their earnings, prompting some of the Dumagat to give up parts of the land to others with a little more money to work the land. With the government’s renewed drive to build dams over their communities, the Dumagat and Remontados are hearing promises again of life supposedly improving because of the dam. In Norzagaray, such promises had torn some indigenous families apart . But “Let’s ask those displaced by Pantabangan Dam, Angat Dam and Wawa Dam,” Nico delos Santos, son of the murdered Dumagat environmentalist, Nicanor delos Santos, said in a roundtable discussion last September of leaders of communities to be affected by dam-building. Like in past struggles against the dam project, the Dumagat women like Nanay Nene are adamant that they will not take this sitting down. 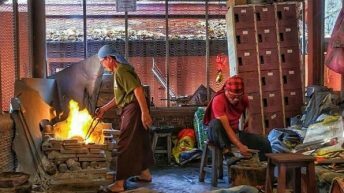 On top of their household and production roles she and other Dumagat women have embraced the added responsibility of building unity among their neighboring villages and outside it. The women see the need to counter what they call as false information being spread among the indigenous groups by government agencies who they said “should know better.” To them these agencies include the NCIP (National Commission on Indigenous Peoples). The Dumagat and Remontado women are taking their role seriously in the bid to save the river, the environment and consequently their homes and life. Indeed, the Dumagat women are closely linked to the water – they use it for cooking meals, cleaning up, washing clothes, nurturing food crops. Lately they are also learning the ropes of ecotourism. As the men are kept busy with work in the field, and they are more often accosted by government soldiers who invariably accuse those they see in the mountains as rebels, the women have taken it upon themselves to spread understanding and updates to the neighboring communities. With the support of the men, they tell us the women are organizing and spearheading protest actions for the river. They make the most of the women’s natural disposition to talk and swap stories after the day’s work. With them active in the struggle against the dam, they have formed a women’s assembly called Imaset. And they have even come up with a song and unity dance calling on the “kadumagetan” (the Dumagat people) and everyone to unite and defend Sierra Madre.